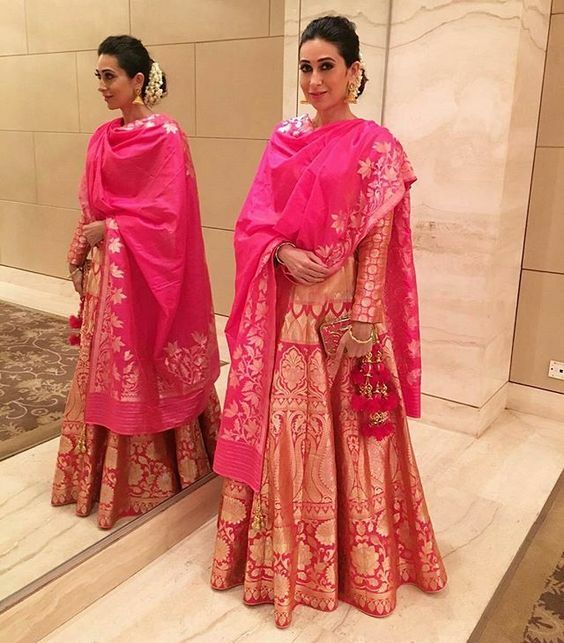 Brocade is the most amazing fabric which can be an inspiration for many garments. The latest trend is for the bridal lehngas. The fabric has such a rich and royal feel that any bride can turn this fabric into her dream wedding lehenga. 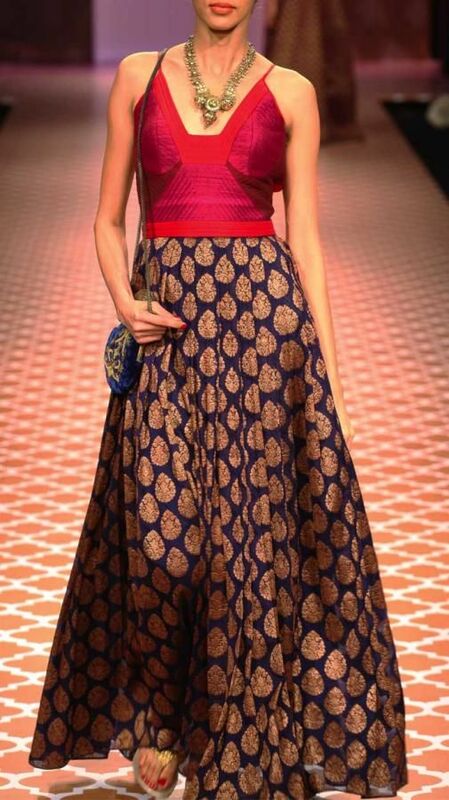 One can choose between the Banarsi and Chanderi brocades, Georgette ones can be used too. Plain lehngas in these fabrics look rich, though there is no need of embroidery if you are choosing it for pre-wedding functions, little embroidery though can be used for the wedding lehngas. All over Brocade Lehnga with contrast embroidered blouse– Lehnga in all over jaal brocade, is perfectly teemed with a contrast embroidered blouse. The cut of the blouse is very Indian which makes it truly a design to go for. 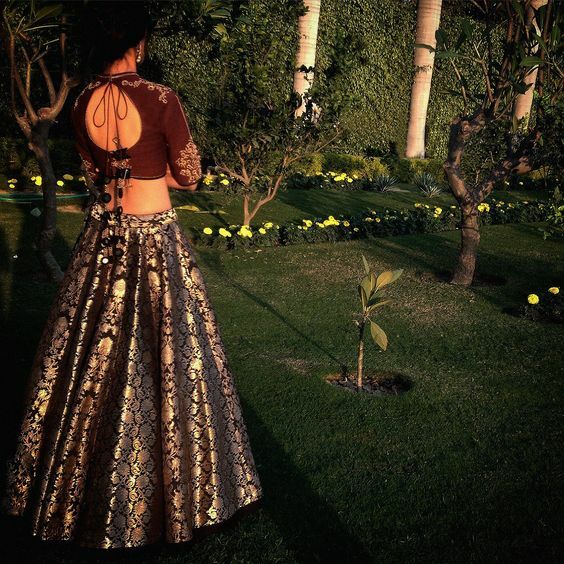 Chanderi Brocade Lehnga– If you want to go for lighter fabrics in brocade, choose chanderi brocade.They are much lighter than Banarsi and other brocades. They come in different designs and colors too. If you cannot find your shade then pick up a white dyeable fabric, and get it dyed in your favorite shade for the occasion. Kanchevaram Brocade lehnga set in single color– Well when we speak about brocades, nothing beats the Kanjeevaram silk brocade of south. Bright colors in different patterns of gold, make them stand out. A short jacket style blouse can be teemed with a chanderi or a textured silk dupatta. 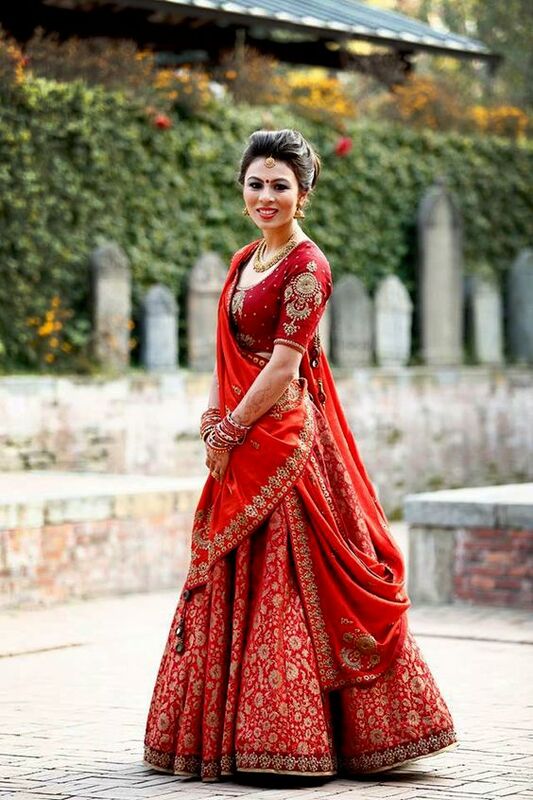 Brocade lehngas– Go all red for the wedding day with a brocade lehnga in red. Match it up with a embroidered red blouse and embroidered dupatta. Brocade lehngas– One can also team brocade lehngas with a plain golden blouse and a plain dupatta. 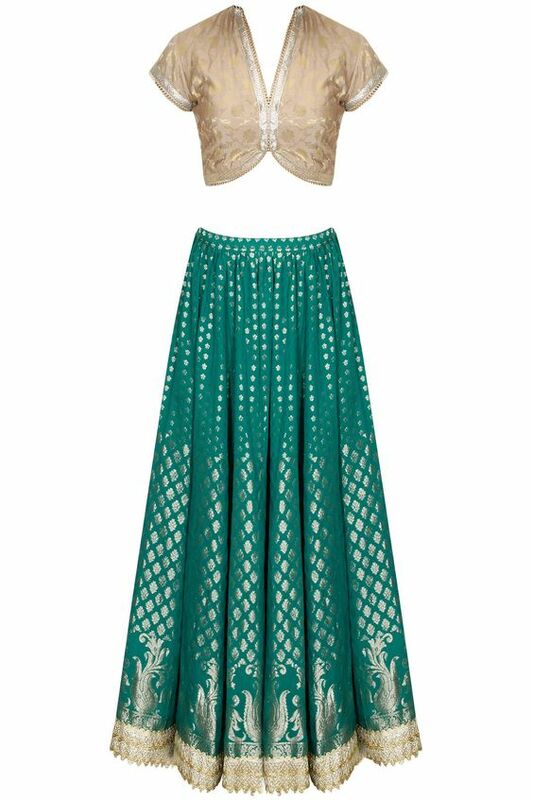 Brocade lehnga with a top style choli– Pure silk choli in plain can be teemed with a chanderi brocade lehnga. Pick bright colors in raw silk for a contrast effect. Since neon shades are in trend too, one can combine these traditional brocade lehngas with neon shades blouses in silk. Zari booti brocade– One of the most common of all brocades, the small zari booti design comes in different shades. Seen here is a bright peachish orange lehnga in zari booti, which is combined with a contrast blouse in ink blue and peach dupatta. How much is that lengha Krishma kapoor wearing banarasi brocade lengha. I really wanted to buy that lengha. How much is that in U.K. Pounds. 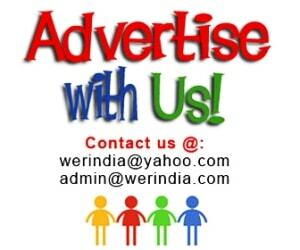 You can go through websites like http://www.indianroots.com, http://www.carmaonline.com or you can even get a customized set for yourself from the brand POSTCARD, https://www.facebook.com/postcardbyswatiandgaurav/?ref=aymt_homepage_panel.